Technology regularly introduces new paradigms, advances or improvements that create a huge hype around them, boosting the market, creativity and competition. The Internet of Things is one of these, according to the numerous studies and forecasts that have been conducted, and proven to be quite true so far. As it is usually the case when this happens, the number of topic-related products and gravitating services starts increasing, and in the specific case of the IoT, every day brings a new player in the different market segments: prototyping, platforms, smart home, fitness and health, connected vehicles, etc. The profusion of (IoT) actors and products creates positive competition among them, which brings many advantages: it raises productivity and efficiency, increases quality and innovation, while reducing prices, which is good for consumers. Competition also promotes dynamic markets, eventually leading to economic growth. While this variety of players and products is rather positive, the pace at which they are introduced has a few drawbacks, among which the lack of standardization and interoperability. For example, although Nest, Honeywell or Ecobee thermostats provide quite similar features, they do not expose them through identical APIs. Hence, when purchasing smart home devices (cameras, alarms, thermostats, etc.) from different manufacturers, chances are to end up with one different mobile app per manufacturer, to control the different devices. Thus, there is a wide variety of products in the market, which cannot really communicate with each other although they – nearly – expose the same behavior through different APIs. Although this can easily be accommodated for if – as a consumer or as a developer – you decide to stick to one “brand”, this is rather hindering in the more probable case where you are trying to build a solution that combines the best of breed products. The above is actually a recurrent scenario in the technology field. Some actually see this as an opportunity to offer middleman – or hub – services, as it is the case for scriptr.io, to a greater extent. Indeed, implementing large scale and real-life IoT solutions involves the orchestration of multiple heterogeneous devices and APIs, while guaranteeing quality of service (scalability, reliability, throughput, etc.). This is something that scriptr.io provides, drawing from years of hands on experience. Since most devices currently have limited processing capabilities and thus cannot handle complex treatments, nor fulfill important storage needs, these latter have to be delegated to back-end services and be exposed to devices as APIs. Even when – thanks to the progress of technology and to cost reduction – many devices will see their capabilities enhanced, a majority of IoT solutions will still have to factor out part of their business processes, rules, and data storage into the back-end (on the Cloud or even on the Edge), because these need to be shared across the multiple actors of a solution. 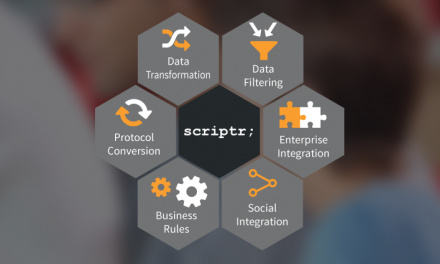 scriptr.io is a Cloud platform for implementing scalable, secure and robust IoT applications. It notably provides orchestration and integration capabilities, allowing to integrate with any third party APIs and services – including bespoke components, and orchestrate them to execute business processes. Moreover, orchestration scripts can be exposed as REST APIs in a snap, opening them up to other apps or devices. The user also owns a Myfox shutter controller and a Myfox home alarm system that are used to close/open the house shutters, respectively arm the security mode. The temperature is regulated using a Nest smart thermostat. We now have a working smart home orchestration.